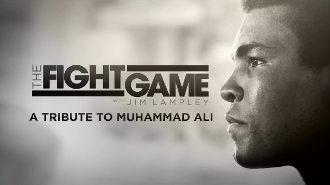 The Fight Game with Jim Lampley: A Tribute to Muhammad Ali HD Blu-Ray. A special exploring Muhammad Ali's impact on sports, culture and politics. The guest list for the special includes Hollywood icon Jack Nicholson, Muhammad Ali's longtime friend; former heavyweight champion George Foreman, who fought Ali in 1974; and rapper/film star LL Cool J. Also participating in multiple panel discussions will be social activist Harry Edwards; 1968 Olympic medalist Tommie Smith, who was stripped by the IOC for taking a stand at the medal ceremony; New Yorker journalist Kelefa Sanneh; boxer and HBO commentator Roy Jones Jr; HBO broadcaster Max Kellerman; and former HBO Sports commentator Larry Merchant, who covered Ali through his entire professional career. Blu-Ray Set Includes: Full Special.